Empire d'Allemagne (Ancienne Confederation Germanique). 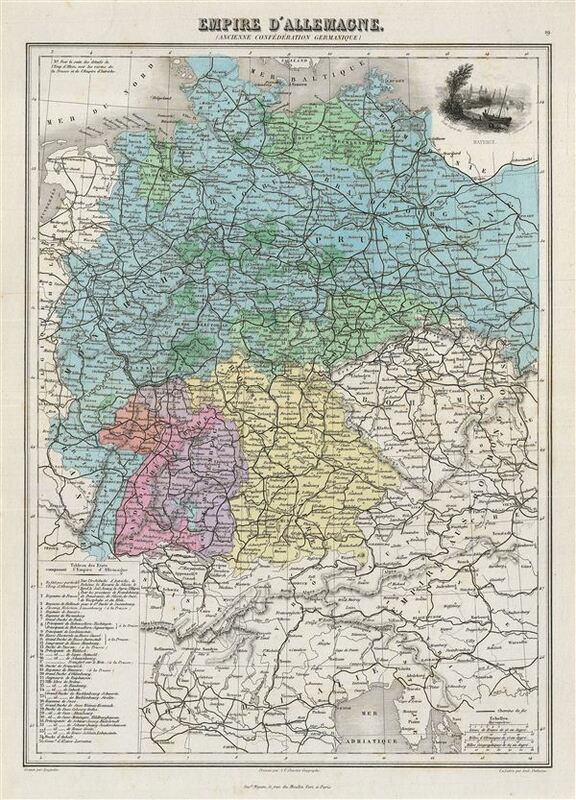 This is a fine example of J. Migeon's 1878 map of the German empire. It covers the German Confederation from the Baltic Sea to the Adriatic Sea and from France to the Austro-Hungarian empire. The lower left quadrant features a table listing the states of the German Confederation. In the upper right quadrant there is a beautiful decorative illustration of Mayence (Mainz). Migeon identifies various railway lines, rivers, mountain passes and other topographical features. Migeon's Geographie Universelle, published in Paris, is one of the last great decorative atlases of the 19th century. It contains many stylistic elements of early 19th century cartography such as full hand coloring, numerous decorative vignettes, and high quality paper. This map was issued as plate no. 19 in Migeon's Geographie Universelle.